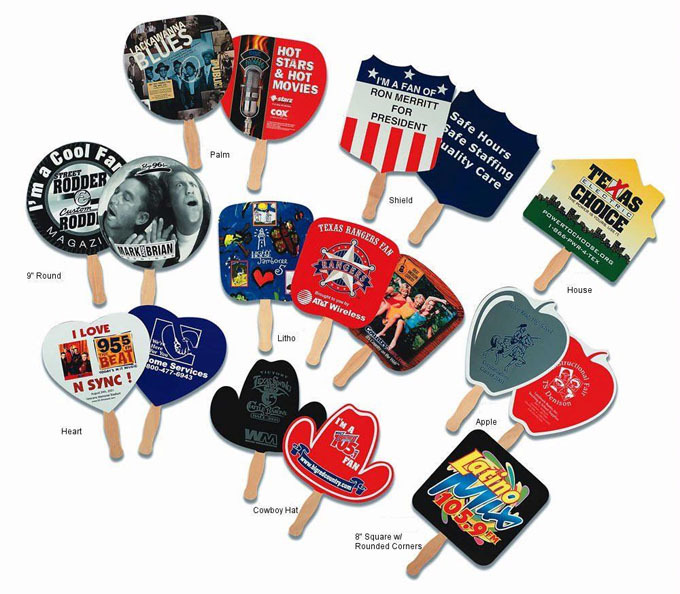 Stock shaped hand fans are a great way to create a unique advertisement any business or event and save a bit of money at the same time. Instead of paying for the custom die-cut fan you can choose one of our many pre-cut shapes like light bulb hand fans, helmet hand fans, circle hand fans, apple hand fans, balloon hand fans, and more. We have a stock shape hand fan for almost any occasion. Print a name, date, logo, or custom graphic on a promotional stock shaped hand fan to promote your business today! Not finding what you're looking for? Then contact us and we can help you find that custom printed hand fan you want. Price includes one color, one side imprint on white, 18-point board, which is coated on one side. Wooden handles are stapled to the fan, and the staples will appear in the imprint. Imprint area will vary, depending on the shape of the fan. Specify shape on order. Fold-Over Fans available in most stock shapes. Extra Charges: Recycled White Fan Board, Add $.03 each. Printing Plate: $37.50 per color, per side. FIRST PLATE FREE with camera ready art. Glue Handles: Add: Single Ply Fans: $.13; Fold-Over Fans: $.22. PMS Color Match: $25.00 per color. No PMS charge for standard inks. See list under General Information tab.